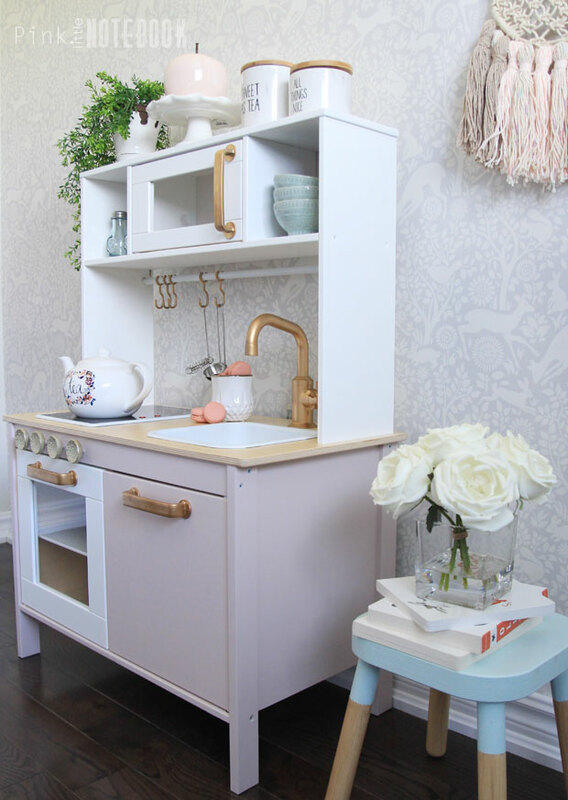 You may have seen these mini kitchens before, the IKEA DUKTIG is a popular choice when it comes to play kitchen’s. It’s stylish, affordable and makes for one heck of a good tweak. Customizing this play set can be as simple as changing the colour palette or as complex as making elaborate changes. The sky’s the limit! 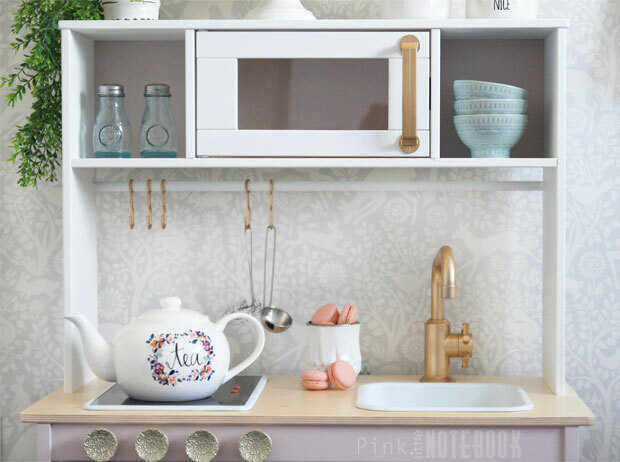 Here’s how we personalized our daughter, Olivia’s kitchen to match her adorable room. With any IKEA piece, assembly is always required. 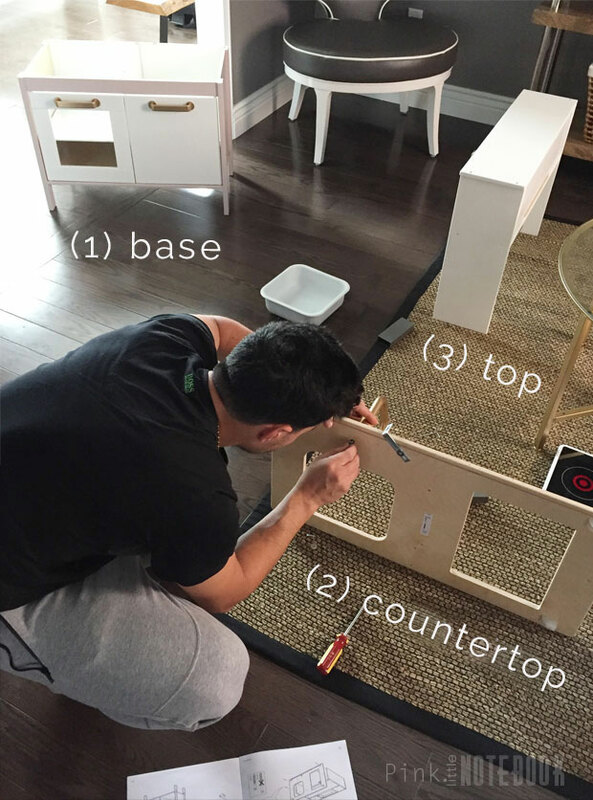 I found it easiest to assemble the set into three pieces—the base, the countertop and the microwave top. This allows for easy painting without having to tape certain sections. 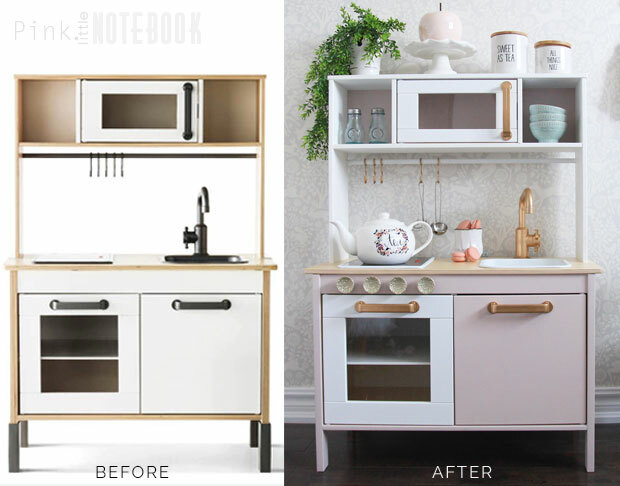 To make this kitchen seamlessly fit right into Olivia’s whimsical room decor, I chose the same paint colours from her bedroom. The base of the kitchen is pink and the top received a coat of white for a little added contrast. Once your paint is dry you can finish assembling the rest of the kitchen. Since the countertop receives the most wear and tear by Olivia. I left this as is. In my case, the natural wood works well in her room. I would not recommend paint, this will definitely chip over time. If you do want to dress up the countertop, either a stain or contact paper is the better choice. All hooks, hardware, faucet, sink, oven trim and rod were spray painted in either gold or white. I also found some cute knobs to go above the oven which I drilled right into the wood. 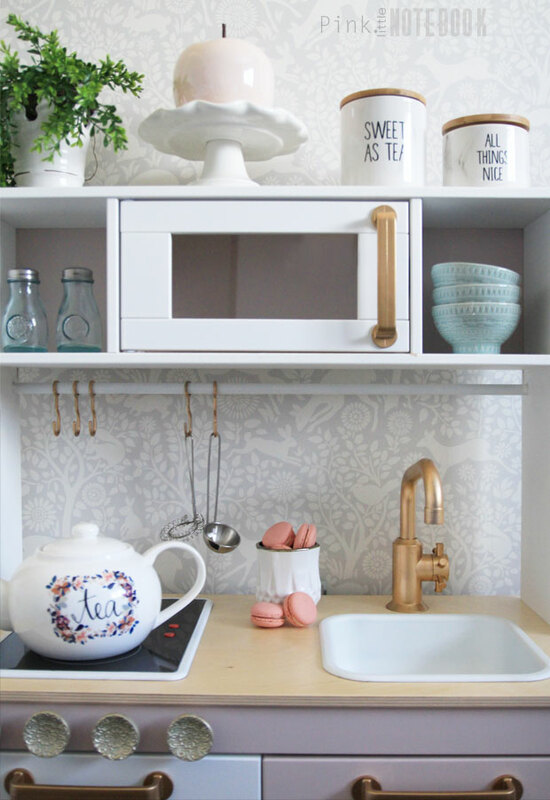 Of course no kitchen is complete without a few cute accessories. The wooden stool is another IKEA product which I painted, it belongs to Olivia’s reading nook which you can see more of here. I foresee many years of play with this IKEA DUKTIG play kitchen. It’s sweet, soft (in colour), and exactly what I envisioned. 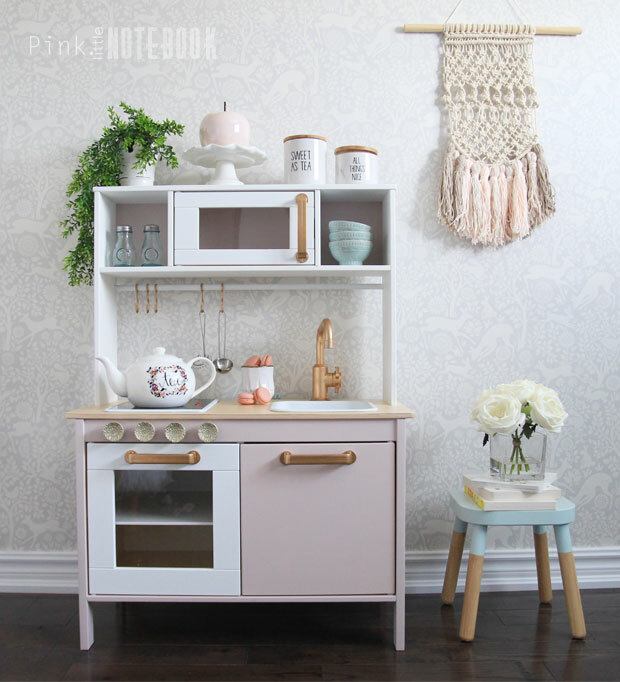 Have you created your own version of the DUKTIG play kitchen? Tag me in your photos, I would love to see! That looks amazing! My daughter wants one of those Ikea kitchens. Might follow yoir tips to customizing it. This is so cute. Need to share this with my sister so she could do this for my niece. Oh wow! I don’t have kids, but this is so adorable!!! I’m sharing this with my sister for my niece! This turned out adorable. Would love for you to stop by and link this up to More The Merrier Monday. Wow this looks soo cute! I think we can make this for my niece! Hi, it’s amazing. Does the paint hold on the plastic parts? This is my favourite Duktig kitchen hack I’ve seen!! Thanks for posting. Where is the plant from? Hi Lindsay, the faux plant is from Michaels. Could you share the paint reference of the pink? Did you use a primer under the paint? Hi Julie, No I didn’t use a separate primer. I just sanded really good and used a paint and primer in one. Hi! What did you use for the sink, handles and faucet? 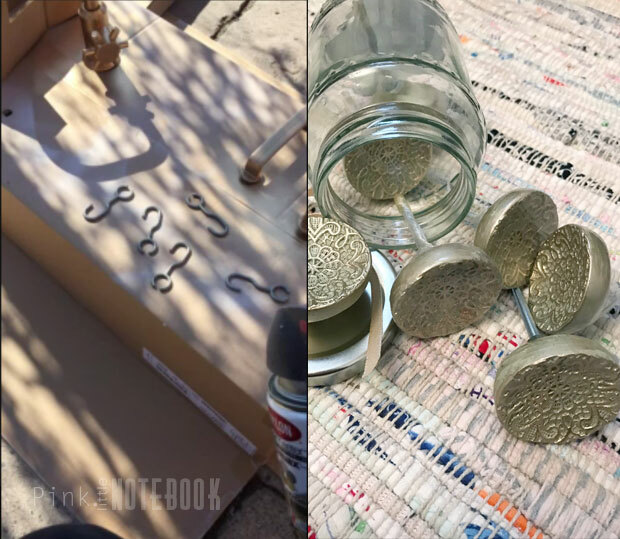 I recently attempted this hack with Rustoleum spray paint and it chipped/scratched immediately! I don’t recall which spray paint I used, however, I’ve noticed in the last year that the spray paint started to chip mostly in the sink. If I had to do this again, I would probably look for a better paint to use on plastic and I would change the handles out for real brass ones. With that being said, the painted wood is still holding up great!